The 4-H Government Intern Program, sponsored by the Herkimer County Legislature and administered by Cornell Cooper-ative Extension 4-H Youth Development Program of Herkimer County, recently concluded another successful semester. Ten students representing the Herkimer County school districts of Town of Webb, Central Valley Academy and Poland Central School participated in the program by exploring current issues and learning more about the functions of their county government through the committee system. Students reviewed issues, toured county facilities, interviewed county legislators, and attended a county legislature meeting. Participating from Town of Webb school were Ally Cooper, Allie Evans, Megan Greene, Carissa Huber, Luke Monroe, and Carter Lawrence. Key presenters involved in the success of this program included: Steve Dietz of the P.I.N.S. Unit; Herkimer County Sheriff Chris Farber; Lou Christie and Connie Shepherd of the Board of Elections; Linda Patten of the Department of Social Services; Herkimer County District Attorney Jeff Carpenter; Mike Scalise of Probation; Herkimer County Clerk Sylvia Rowan; and Family Court Judge John Brennan. At the final session, the interns staged a simulated legislative mock meeting and provided presentations on current issues confronting county government. Topics discussed were Visible help and Police presence, Small Business Web page Develop-ment, and Creating an Uber Service in Town of Webb. 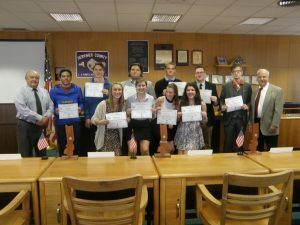 The students thanked all of the participating Herkimer County Legislators for their visits and help in researching topics that made the program an engaging experience. For questions on this or other 4-H programs, please contact Cornell Cooperative Extension of Herkimer County at (315) 866-7920. This entry was posted in admin and tagged 4-H, town of webb school on April 21, 2016 by Gina Greco.